Baobab is the new exotic superfruit from Africa with three times more Vitamin C than an orange and twice as much calcium as milk. The Baobab Tree is an emblem of the African landscape and Senegal's national symbol. 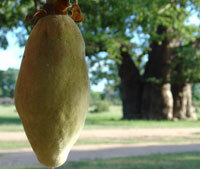 In Sudan it is known as 'Tabaldi' and it's fruit 'Gongalis'. The fruit has been used for millennia as a nutritious food. 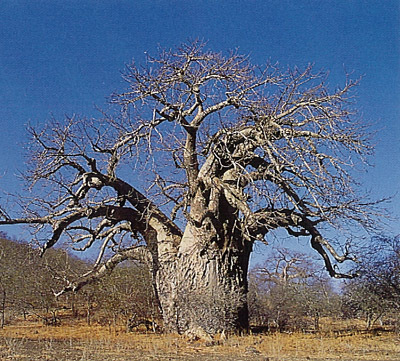 'Adansonia digitata' is the is the most widespread of the Adansonia species on the African continent. It is a native of Madagascar which has six of the eight species. It’s not a cultivated fruit as the tree grows wild throughout the south of Africa and until recently only rural local communities collected the fallen fruit. In parts of the world it is a symbol of survival in inhospitable conditions. These trees generally live for well over a thousand years with some reaching 3 times that age. However, in Limpopo (South Africa), there is the "Big Baobab Pub". Built by the owners of Sunland Farm inside the hollow trunk of a 22 metre(72 ft) high baobab. It measures 47metres(155 ft) in circumference and is said to be over 6,000 years old. Many people will be aware of this tree through Disney’s cartoon movie "The Lion King", as the Tree of Life. Rafiki the wise old mandrill-baboon in the same film makes his home in such a tree. With the World Cup set in South Africa expect to see lots of images of these amazing trees. It's large green or brownish fruits resemble gourd-like capsules that are around 6-8 inches in length. These capsules contain a soft whitish fruit pulp that has the appearance of powdery bread and kidney shaped seeds. 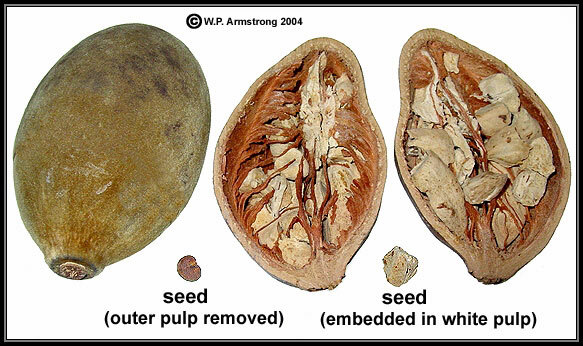 After being cracked open the powdery fruit pulp is separated from the seeds and shell before use. Strangely until the EU granted it novel food status in 2008, it was illegal to import either its fruit or the pulp which is processed into a powder. The white powdery fruit pulp can be blended with many foodstuffs as an ingredient and its unique tangy taste can flavour drinks, ice creams, yoghurts and even be used in bakery products. be a richer source of iron than red meat, spinach and lentils. contain twice as many antioxidants as Goji berries and six times more than cranberries, blueberries and blackberries. More than six times higher potassium levels than Bananas or Avocados. So, this does seem to be a healthy and versatile foodstuff. I’m glad to say that at long last we in the rest of the world can not only try this new and refreshing fruit, but in doing so we can help rural communities in Africa who benefit under Fair Trade arrangements from the wild harvesting of the fruit. A number of products now contain the fruit and are already available. An enterprising food entrepreneur has launched a range Jams and spreads and even Lemonade. I can speak from personal experience when I say the taste is great. See www.yozuna.com for more information.